I originally intended to start this week by doing all of the cutting for the quilt. But as I was working on it myself (had to double check that math!) it occurred to me that it would be way more fun to start assembling it right away. You’ll get the satisfaction of seeing it come together quickly and you’ll be able to play around a little more with your fabric selection and layout. This will also give us the opportunity to have a periodic link up to see how the quilts are looking! Here is your Barn door assembly chart, containing all of the measurements for the entire quilt. This week we’re going to start in the center and work our way out. 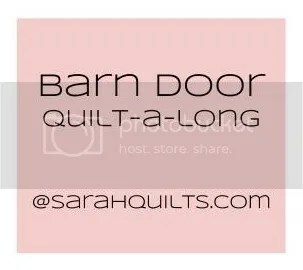 Without the borders, barn door is a 63 3/4 inch square that forms the primary “X” design of the quilt. Image credit: Anne at play-crafts.com. Thanks Anne! 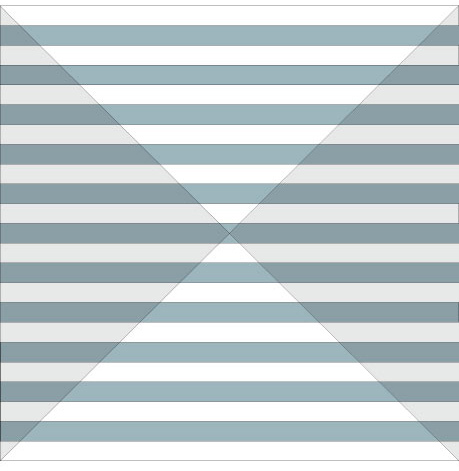 This X is composed of 23 strips. To create the assembly chart I numbered the strips 1 to 23 from top to bottom. Most of the strips in the quilt are composed of one middle strip, 2 HSTs (half square triangles), and 2 side strips. Edit: All of the strips are 3 1/4 inches wide. You can find my HST & hourglass unit tutorial here, and my cutting tutorials here and here. For even more basics, read through my beginner’s series. 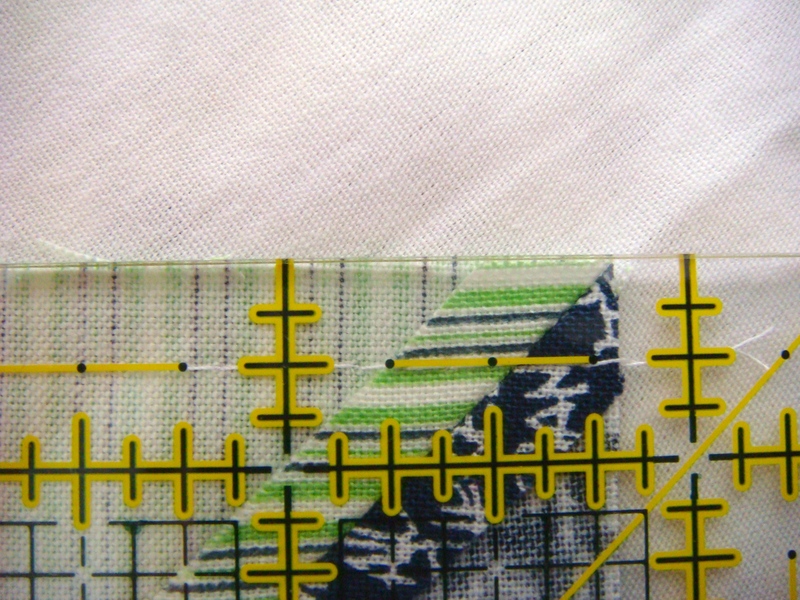 When you assemble your strips, be sure you join each unit with a true 1/4 inch seam. As in most quilt patterns, the math for this design depends on an accurate 1/4 inch. Anything more or less will cause trouble when you are lining up your rows. I like to keep a small ruler right by my sewing machine and I frequently check my seam allowances. For this quilt, I think it’s helpful to be able to nest your seams when you are lining them up. I press all of my middle pieces toward the middle and all of my outer strips toward the outside. Your triangles and hourglass don’t have any abutting seams so you can press them any way you want. I chose to press them open so my quilt top will lay flatter. If you don’t want to have to think about which way to press your seams, pressing them open is always an option. It just makes lining up the points slightly trickier (in my opinion). Once you have your first 2 rows assembled, joining them immediately will help you determine whether you’ve cut and sewn accurately up to this point. If your points are not lining up, try to figure out what has gone wrong. Double-check your measurements and your seam allowances. This is another advantage of assembling a little at a time! I advocate heavy pinning and I’ll tell you why: fabric stretches. Pinning doesn’t just ensure that your components line up, it offers some resistance to the tugging of the presser feet and feed dogs on the fabric. 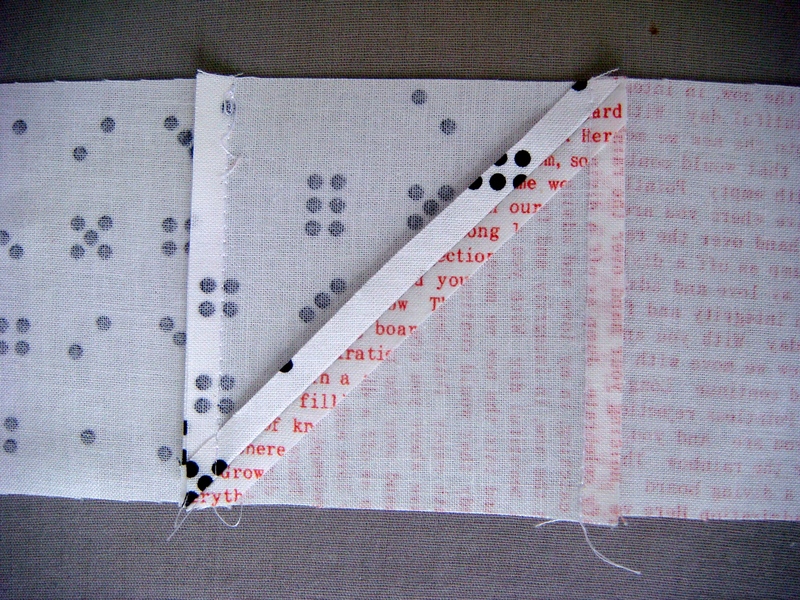 If you often have a small amount of fabric that sticks off the end of one side of your work, that is why. I know it’s an extra step, but it’s worth it to avoid dealing with the uneven edges later. Focus on lining up the angles of the triangles. The lines of the triangles create the “X” design of the quilt. Pin where the triangles meet first. Then place one pin at each outside edge of the strips. Keep adding pins in the middle of the pins you’ve already placed until you have pins every few inches. 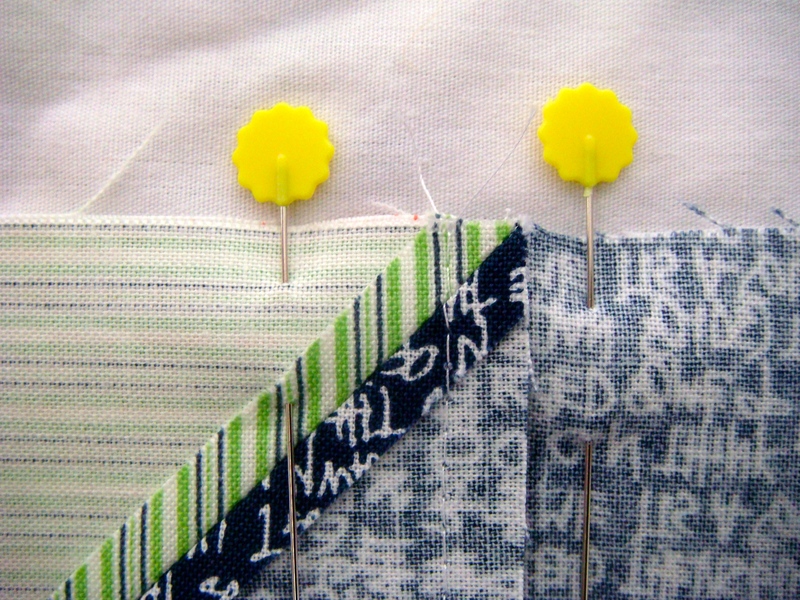 Sew your strips together, removing the pins at the last possible second before your needle reaches them. Continue assembling strips until you have your center 7! Or of course if you’re on a roll keep going. You now have all the information you need to complete the entire quilt top. Please don’t hesitate to leave a comment or send me an email if you have any questions. 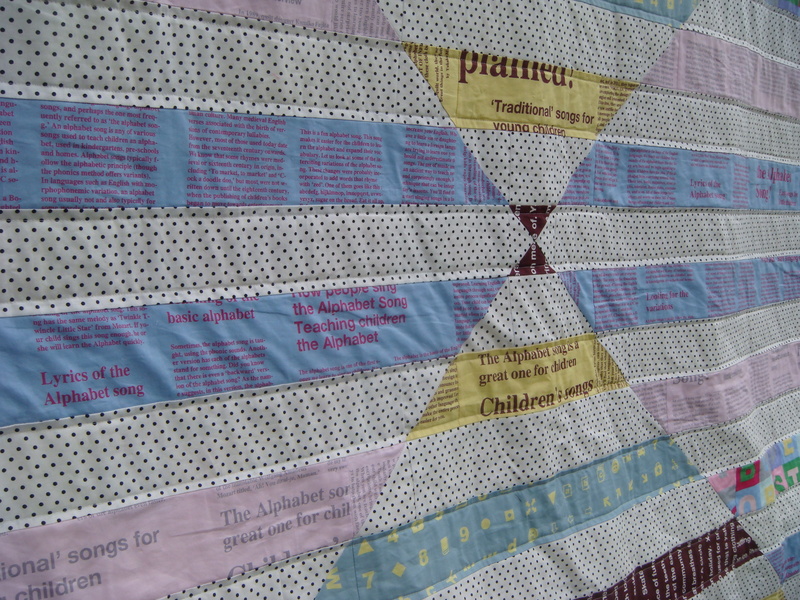 One of the benefits of a small quilt-a-long is the opportunity for more extensive interaction and collaboration. Don’t forget to post your progress on our Flickr page! Let me know if you guys are Intagram users. I could dust off my account if it’s something you guys want to do. #barndoorQAL anyone? 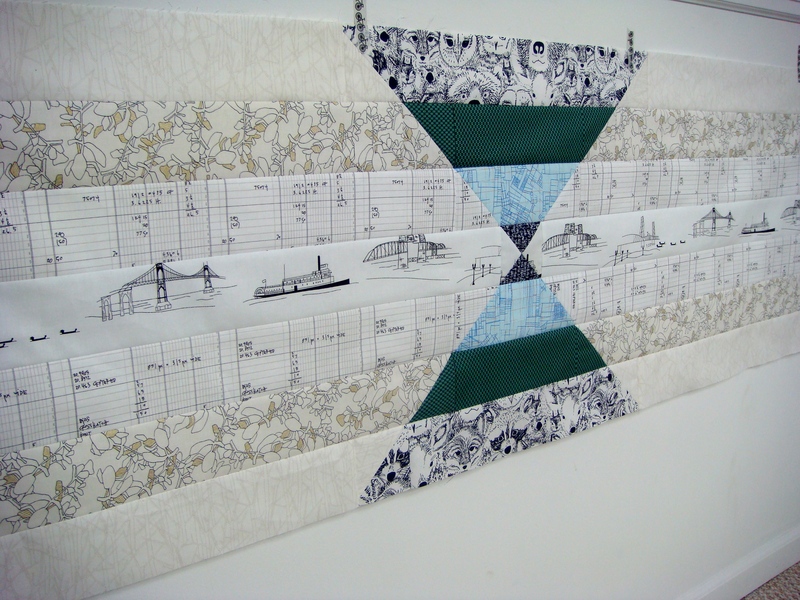 This entry was posted in Barn door quilt-a-long, Uncategorized. Bookmark the permalink. I’m so glad that you decided to post the schedule this way because I need to experiment some before I commit to cutting all my fabric. One of my fabrics has a strong geometric pattern that I don’t want to interrupt, so I’m going to attempt to incorporate the HST right onto the end of those strips. Right now, my brain is fiddling with 2 different plans of attack. I figure that best case scenario is that I figure it out. The worst case scenario is that I waste a little bit of fabric (gasp!) and have to trim off the wonky edge and use the remainder of the strip for one of the shorter pieces farther down the quilt. 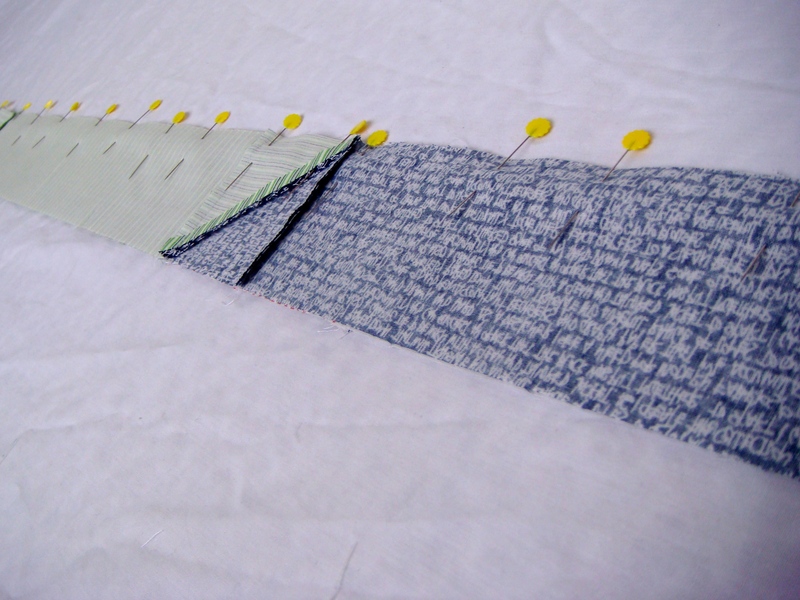 You could try using 45 degree seams instead of HSTs, like when you’re making binding. 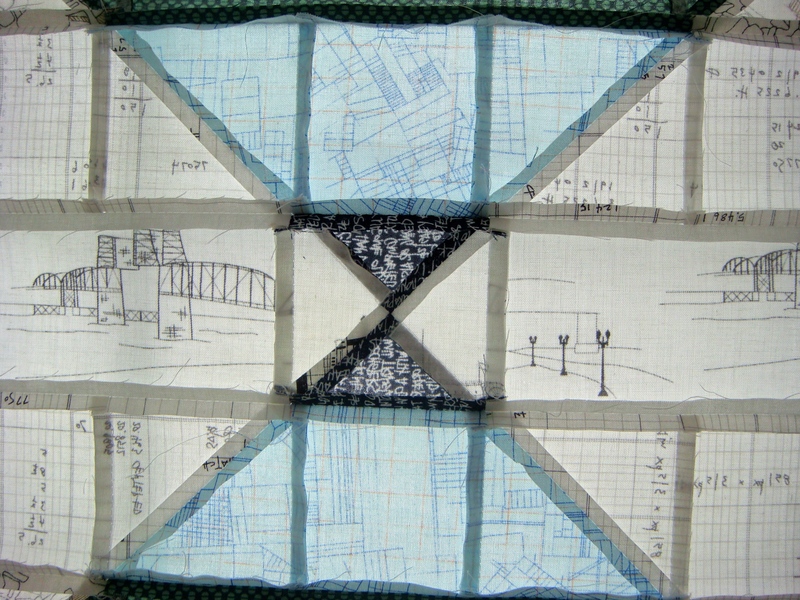 That was actually my first idea when I designed this quilt, but I decided that math would be too hard to communicate. So instead I decided to embrace the “patchwork” look and intentionally NOT line up my prints. I know the print you’re talking about from your Flickr photo though, and I agree that one would look really sharp uninterrupted. An Instagram tag would be great! Also, forgive me if I’m missing this somewhere, but how wide are you cutting your strips? 3 1/4? Thanks Sarah, can’t wait to dive in, hopefully this week! ps – where’s your button? the link I gave you should have given you some html code so you could put a button generator gadget on your sidebar for followers to add to their own blogs. Hooray! I was so excited when I saw this show up in my blog reader. I can’t wait to get started! Your rows look so fab. I was nervous the colors I chose were going to be too similar to yours, but we’re going to have very different projects. Yay! I really love your quilt so I might just have to join in the QAL. I need to see how my time sorts out this week. So excited to start mine. I still need to do a fabric pull. Wow! 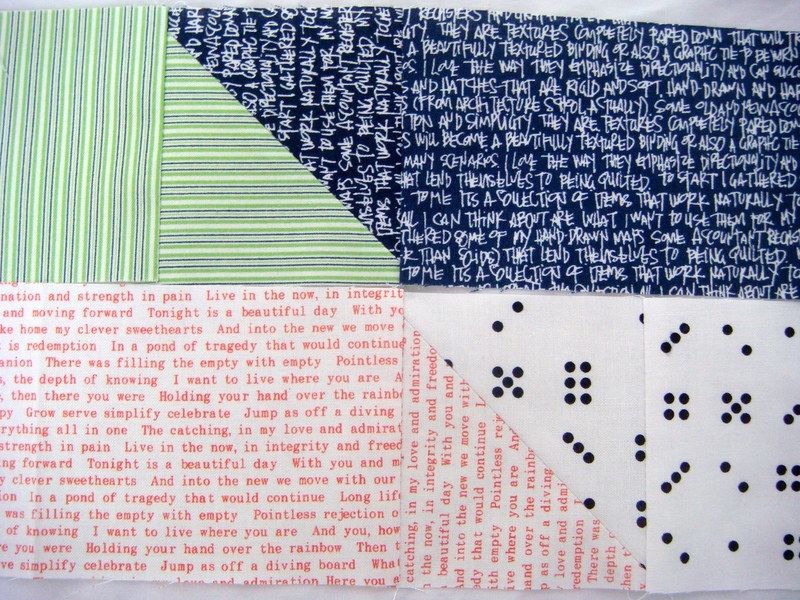 I am loving the fabric choices you have made for this version of your quilt, Sarah! Looking forward to seeing everyone’s progress! This is just g.o.r.g.e.o.u.s. I LOVE your barn doors! I have SO many projects going on right now but I’ve pinned it for future use. I’ll be reading along! I love the fabrics you have chosen – looking forward to seeing more. See I just found the second sheet with the measurements on it. If I had not written that note I probably would not have found it this quick..haha!